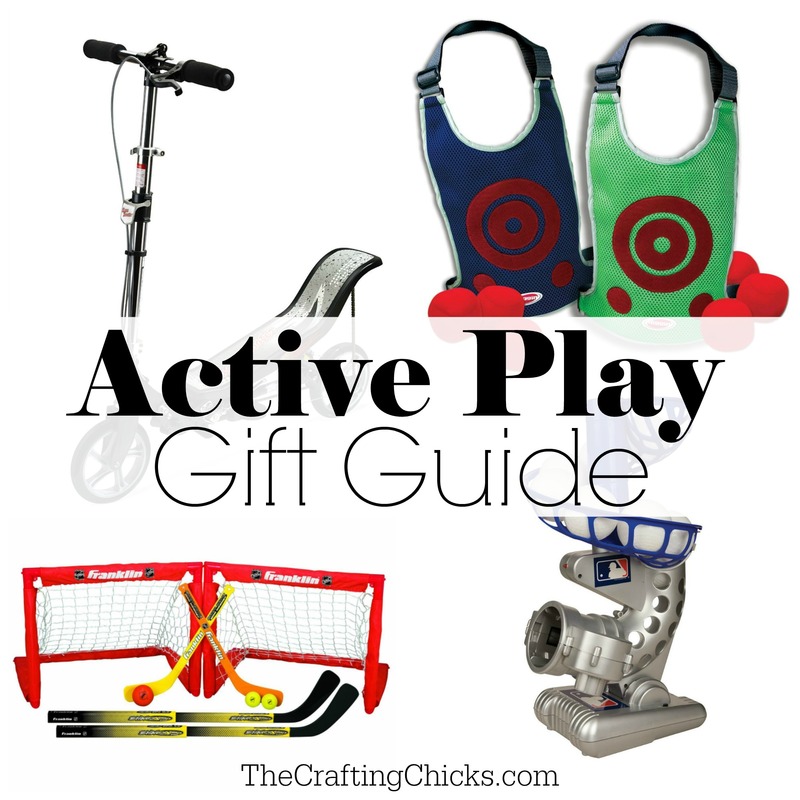 Here it is my friends the Active Play Gift Guide. 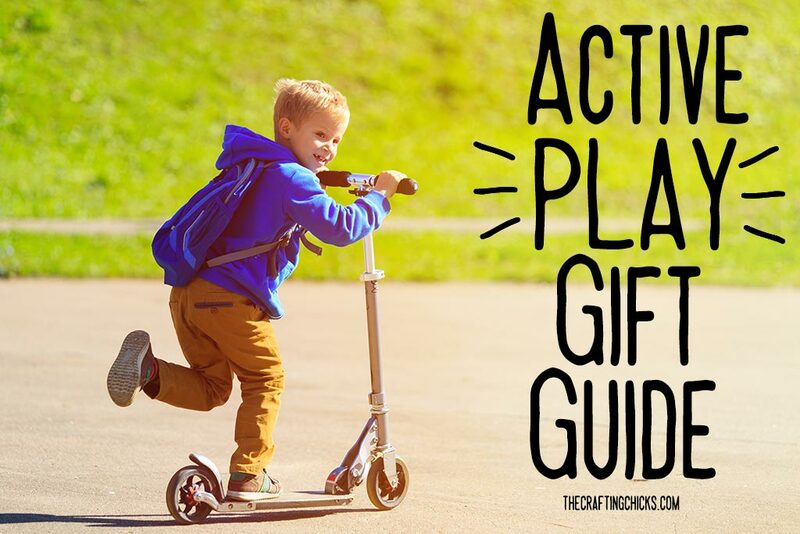 The only gift guide you will need this year and it all revolves around active play. Get the kids to step away from the TV and electronics. It’s time to get active and go play. 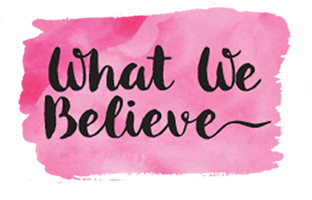 This guide has a little bit of everything for every age group including the classic Radio Flyer Red Rider Trike for younger kiddos and a Hauck Nascar Lightning Go Kart for kids who are looking for a little more this year. I also found this Active Dodge Tag that turns tag into an exciting game. Radio Flyer Red Rider Trike: This classic trike is a must have for all toddlers and preschoolers. Hot Wheels Push Around Ride On Racer: The perfect gift for babies who are always on the go. This ride on toy resembles your favorite toy race car. TMNT Bowling Set: Set them up and knock them down. Classic High-Top Quad Roller Skates: Every kid needs a pair of roller skates. Or check out these inline skates that have light up wheels. Diggin Black Max Light Spiral Football: Step up your football game with this light-up football. This gift would go great with an Inflatable Football Target Set. Active Dodge Tag: Turn dodgeball into tag! Flag Football Set: Teach kids the rules of football with this flag football set. It even comes with a playbook. Glider Soccer Ball: Pick from a variety of colors and don’t forget the Portable Soccer Goal. Nerf Lazer Tag: Tag or be tagged in this intense, real-life lazer combat game! Air Power Hover Hockey Soccer Disc: Kids can stay active even when they are stuck indoors. Light Up Frisbee: Where active play takes place at night. Nerf Modulus Tri-Strike: Nerf wars always keep kids moving. Especially when there is a battle to be won. Indoor 2-in-1 Goal Set: What a great way to keep kids active even if they are stuck indoors. The best part about this set is that it includes foam hockey pucks. Canvas Teepee: Building forts is a ton of fun. Now all you need to do is pop open this teepee for hours of active play fun. Badminton Set: This set is great for all skill levels, even beginners. It comes with everything you need including a net, shuttlecocks, and badminton racquets. 2-in-1 Gradual Balance Bike and Tricycle: Young kiddos can learn how to balance without taking a big spill off of a bicycle. 10′ Parachute: Use this active play gift with a large family or group of friends. With over 100 games to play this parachute will provide hours of play and laughs. Franklin Sports MLB Electronic Pitching Machine: Perfect for baseball fans. Don’t forget the baseball bat. This Fisher Price Grow to Pro Triple Hit Baseball Set is a great setup for kids who are just getting into the swing of the things. Punching Bag With Gloves: Hang the bag from the ceiling or use the stand. This gift helps strengthen hand-eye coordination. Bubble Soccer Suits- Set of Two: Kids will have a blast playing bumper soccer…. but I think parents will have the biggest laughs. BMX Freestyle Kids Bikes: The perfect big kid bike. It comes with a bell, water bottle, and training wheels. Electric Scooter: Go up to 8 mph with the 80-watt chain driven motor. One charge lasts around 50 minutes. Hauck Nascar Lightning Go Kart: I think this is every kid’s dream gift. Beach Cruiser Bicycle: With only one gear and one brake, this bike is the definition of cruising. Ride-On Space Scooter: Rock your feet back and forth to power this scooter. Complete Paintball Set: Instead of picking up the latest video game for the teenager on your list, try introducing them to a new sport, paintballing. SpikeBall Combo Meal: This game is fun for everyone with rules like volleyball. It was featured on Shark Tank. Lets get those kids up and moving this year with these active play gifts. There are so many different ways to make active play fun. How do you keep your kids moving? Will you be putting any of these gifts under the tree? Share your favorites with us in the comments.